Product owners are at the core of every product development cycle. They know what the customer needs, can envision the product, and can communicate their vision to the development team. However, their role in development will vary depending on their environment. In this article, you’ll learn what product owners do, what are their key roles and responsibilities, and what helps them execute their job effectively. You’ll also gain expert insight into the role of a product owner in a Scrum framework and in relation to Agile methodology, as well as learn more about the value of product owner certification. What Is a Product Owner in Technology? Is the Product Owner the Project Manager? How Does the Product Owner Manage Stakeholders’ Desires for the Product? What Is the Role of the Product Owner in Scrum? Product owners are the authority in product development and the public face of the product. Product owners are the leaders, guiding the product’s progress and managing the team toward success. The role is critical in all kinds of product development, especially in the Agile methodology. They struggle to clearly identify goals and deliverables. They get information from a variety of sources without the ability to discern what is key to the project. They lack the accountability within the larger organization to finish the work on time. The product owner offers the single point of information to keep the team focused and to reduce churn that results from waiting for information or answers. They also resolve any conflicting priorities. On a Scrum team, the role of the product owner has since evolved to become the person who clarifies the group’s shared goals, direction, and process. Even more, the product owner works with both internal and external stakeholders to ensure the business is building the best product. Product owners are the primary stakeholders for a product development project. They are the end-to-end gatekeepers for and managers of the vision, strategy, and tactical execution associated with product development. They develop and set program priorities, and handle the product backlog — the list of tasks that need to be resolved before completing the project. The product owner works closely with the development team, researches user pain points and needs, analyzes the competitive landscape, and develops and refines feature lists. They are also responsible for maintaining the integrity and the quality of the final deliverable. The term product owner originated with a Scrum framework (a type of Agile methodology) to develop software. Companies that didn’t have a traditional project management system — and a product manager — initially used the Scrum approach. These companies relied on a small workgroup drawn from various departments, aka the scrum, to identify and complete a project. But they also needed to hold someone accountable for ensuring the team completed the work and met the goals originally set out for the project. Thus, they created the role of product owner to take on responsibility for the success of the product. In addition to typical Scrum development, product owners are now a part of Large-Scale Scrum (LeSS), which applies the concepts and elements of Scrum in a way that scales and pertains to many teams. A range of industries, such as retail, banking, and ecommerce, now employ product owners to articulate the vision for a product and drive it from conception to completion. The product owner drives the Scrum team to complete a project in a short development cycle called a sprint. This small, nimble working group typically is made up of five to seven people across the organization. Each person has distinct strengths and areas expertise, and they are united by a specific goal and timeframe. The product owner works with the Scrum master — a coach who deeply understands the work and fine-tunes the Scrum process to ensure the team is working effectively and efficiently. Both the product owner and the Scrum master focus on the goal and rule out any changes in scope to the project, keeping the team on target to develop the product identified at the beginning of the sprint. While additional ideas may bubble up during the sprint, it is the role of the product owner to ensure there is no scope creep, which adds new features or functionality to a project. Organizationally, the product owner might be considered the center of the universe for product development. Since they are the clearinghouse for all development activity, product owners serve as a liaison between the development team and internal organizations, including product management, marketing, sales, customer support, and the C-suite. The product owner plays a crucial role in technology or software development, understanding what features the customer needs and communicating those requirements to the development team. The product owner gathers user stories: descriptions of the software or application from the customer’s perspective. These can be simple tasks, such as the ability to create a new account or edit a shopping cart. The product owner prioritizes the stories that affect the development of the app or program. In a Scrum framework, the product owner collaborates with both the development team and the customer to clarify what the user wants and what the development team is building. Rather than relying on a traditional requirements list, the product owner prioritizes and manages all the tasks drawn from user stories. Most important, the product owner has passion for the technology and serves as the gatekeeper for features and functionality. The product owner ensures that any item from the backlog adds value to the software or application. Each organization differs in the exact way it implements Agile. Some organizations may have a single role — product owner or product manager — while others employ both roles and identify distinct differences between them. In some teams, the Scrum master is the Agile project manager, who identifies and prioritizes tasks. 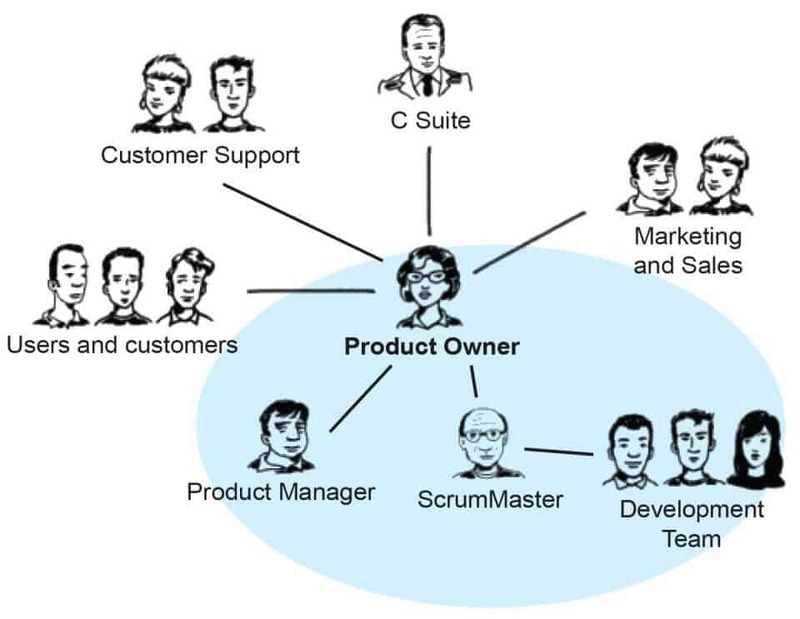 In others, the product owner is the Agile project manager, who is responsible for the success of the project. Pichler also notes that product management has changed since Scrum was developed in the 1990s. In the early days, product managers were responsible for upfront market research, product planning, and the requirements definition. The requirements specification then went to a project manager, who worked with development and test to complete the project. 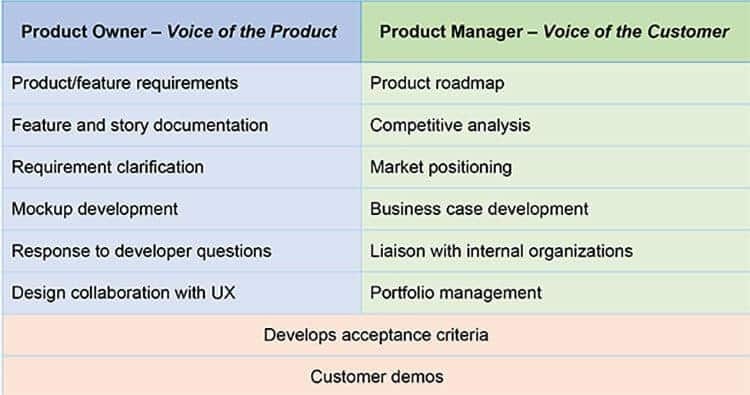 The clearest way to differentiate the two roles is that the product owner represents the voice of the product, while the product manager represents the voice of the customer. Feature Owner or Component Owner: Relies on technical skills and focuses on individual components and functionality to make sure any feature works to the expected standard. Business Analyst: Also known as Agile business analyst or business systems analyst; understands how the business works and communicates with developers to implement the needs of the customer as related to the business opportunity. On-Site Customer: Brings customers into the team in a system known as extreme programming (XP), so there is close collaboration and feedback about the product’s development. This kind of collaboration fosters better solutions that meet your customers’ needs. It also improves motivation and empathy for customers by having developers work with them directly. Product Director: The organization’s expert in understanding the company’s performance and brand, who identifies the suite of products to be developed. What Should Product Owners Know About Stakeholders? We might also consider the role of the stakeholder. By Pichler’s definition, a stakeholder is an internal person (as opposed to a customer or user) who has a stake in, is affected by, or shows an interest in the product. Stakeholders make up the key infrastructure that helps develop, manufacture, and deliver the product. Product owners need to be mindful of external stakeholders as well. These can be the client or company for whom you are building the product. More broadly, these are your customers and users. They have a stake in how well the product works and whether they will remain your customer or go elsewhere for solutions. The product owner is responsible for managing stakeholders and should be empowered to identify and stick to the goals of the product. Here are some tips for successfully working with internal and external stakeholders. Know the Plan: Make sure you have clearly identified the scope of the project, the timetable, and the resources. Communicate your strategy and roadmap clearly to all stakeholders. Be a Leader: The product owner is not simply the person who takes orders and tries to accommodate all requests. Be ready to say no when a request falls outside the scope of the project or yes when it improves the work ahead. The team depends on the product owner’s skill at listening to stakeholders and separating the signal from the noise. Advocate for Your Customers: The product owner clearly understands and explains the product. The product owner can also articulate when ideas best suit the interests of customers and when they are outside the scope of the product. To learn more about working with stakeholders, read this article. Obtaining your certification as a Scrum product owner demonstrates your commitment to your career and your understanding of the job. It can make you more valuable to your team and set you apart from other job candidates. While the certification doesn’t reflect your real-world expertise, it shows that you have spent time studying the best practices that make you more effective as a product owner. The average annual base salary for a product owner ranges from $93,000 (Scrum Alliance) globally to $101,000 in the United States (Indeed). Data in the 2017-2018 State of Scrum Report by the Scrum Alliance show that certifications and years of experience lead to higher salaries. Scrum Alliance: Certified Scrum Product Owner® Certification, a two-day in-person program that includes classroom study, group discussions, and hands-on exercises. Scrum.org: Professional Scrum Product Owner™, a two-day in-person course with instruction and team-based exercises. Scrum Inc.: Certified Scrum Product Owner Training, a two-day in-person course developed by the co-creator of Scrum, Dr. Jeff Sutherland. Project Management Institute: PMI Agile Certified Practitioner (PMI-ACP)®, which has experience and education requirements, and includes passing the PMI-ACP exam. 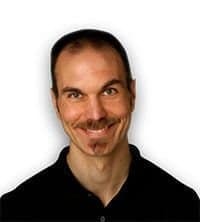 Roman Pichler: Certified Scrum Product Owner, two-day in-person workshops in Germany and London. ICAgile: A track of certification programs, including Business Value Analysis, Enterprise Product Ownership, and ICAgile Certified Expert in Product Ownership. Scaled Agile: SAFe® 4 Product Owner/Product Manager (POPM), a two-day course specifically for Scaled Agile framework. 280 Group: In-person and online courses to prepare you for the Agile Certified Product Manager and Product Owner® (ACPMPO) exam administered by the Association of International Product Marketing and Management (AIPMM). Simplilearn Solutions: CSPO certification training, two-day classroom training. Learn more about training resources and the value of certification here. Another valuable resource for product owners is Robert Galen’s book Scrum Product Ownership: Balancing Value from the Inside Out. The product is at the center of the product owner’s job. To find the right product owner, you need to identify the type of development and product. The role and vision of the product owner can vary widely depending upon the type of product. Commercial Software or Product Development: Developed primarily to drive revenue for external customers or markets, this requires a product owner who has strong organizational and technical skills, as well as a firm grasp of the market and the audience. Internal Solutions or Development: As with commercial software development, product owners for internal software solutions must possess organizational and technical skills. However, here the “market” consists of the product owner’s company and its competitors, and the “audience” is the organization’s business and technical decision makers (BDMs/TDMs) and employees. The development group can be information technology or systems development. Project Development: This work usually involves one external client or customer, often as part of a contract. The product owner typically is from the company contracting the work and is therefore close to the user experience, understanding the hands-on needs of the customer. Authority to Do the Work: The organization has to empower the product owner to make decisions and complete the project. Stakeholders and bureaucracy can’t undermine the work of the authority of the product owner, but should provide a strong network of support. Product owners have to ensure they have the full support of key leadership. Leadership: A product owner has to be a leader from the beginning of the project. They must provide a strong voice to inform the decisions around what (and what not) to build, identify market gaps and customer needs, and provide clear, actionable feedback to guide development teams. The product owner is also a developer of the project, the vision, and the team. And they must demonstrate commitment to the product by being available and engaged throughout the development cycle. Decision-Making: The product owner must be able to make decisions quickly and with authority. After all, this person has deep knowledge of the needs of customers and stakeholders, including domain knowledge of the market and the environment for the product. Communication: A product owner has to build a team, as well as work with internal and external stakeholders. It’s critical to be able to share the vision, focus the work, and communicate with various constituencies. The product owner also connects the people with the information. Developers may need to talk directly to users to get the details they need about the code they are writing. Stakeholders may need to talk with the business analyst to gain insight about the customer value of the product. You don’t have to be the expert in every conversation, but the product owner is the knowledge broker. Delegation: While the product owner is responsible for the overall output, they cannot be the only person doing the work. The product owner has to know which duties fit best with the skills of each team member and ensure smooth collaboration. They provide the oversight and finds resources to ensure the job is complete. Conflict Resolution: No project proceeds without some disagreements along the way. In the words of Lowell Lindstrom, a Certified Scrum Trainer® and one of the early pioneers in Agile software development, "If you can't handle conflict, you're in the wrong game." Product owners have to stop disputes and find solutions. Some conflicts, however, cannot be resolved at the product owner level. Knowing when a dispute needs to be sent up the chain of command is as important as knowing what to resolve. Stakeholder Management: This can make the difference between progress and chaos. A successful product owner focuses on efficient workflows, clear expectations and milestones, and open and frequent communication. This ensures that the team identifies and resolves issues quickly and meets objectives so that development stays on schedule. Product and Development Experience: While a product owner doesn’t necessarily need to be a trained software engineer, understanding the basic processes involved in software development is critical to developing realistic schedules, workflows, and stakeholder expectations. Experience with existing products or the overall product category is essential to recognizing the market and audience needs. Customer and Market Insight: The product owner provides the core information that informs the features, pricing, sales forecasts, marketing strategies, and more. The product owner’s business savvy will help them make decisions during the development process. To please customers, the product owner must be able to meet their needs and act as the chief storyteller of the value of the product. Tactical Skills: While many of their skills focus on leadership and strategic thinking, a successful product owner also needs tactical expertise. This covers the day-to-day management of what will get done and by when. Set the Vision: The product owner not only sets the goal, but explains how the product will meet users’ needs, align with the company’s strategy, and fulfill the mission. This is a key leadership responsibility. The vision needs to be communicated to the team, the stakeholders, and everyone involved in the project. The vision is the guiding force that the product owner uses to establish priorities and direct the team’s work. It needs to be communicated throughout the project as the “north star” that drives the project. Develop the Product Roadmap: Product owners work to develop plans that dovetail business objectives with product strategy in order to identify technology solutions that meet both short- and long-term goals. Develop Product Strategy: A product strategy breaks down the vision for a product over time and defines the market, the offering, the value proposition, the pricing, the distribution, and more. Communicate with Stakeholders, Development Teams, and the Scrum Master: The product owner relays status; educates stakeholders; negotiates budgets, scope, funding, and schedules; organizes reviews; and performs solution demos. Explain Why You’re Working in an Agile Scrum: The Scrum process may be new to team members and stakeholders. The product owner needs to explain the value of this process and the principles that will drive its success. Limit the Scope of a Scrum Sprint: Many organizations think they are using an Agile Scrum to develop products. In reality, they are building entire systems in a series of sprints, none of which has an independent value. This is a waterfall approach that doesn’t work in Scrum. Scrums are designed as short cycles to develop a defined application, not as a step in a longer process. The goal is to deliver value for the customer through sprints and not use a waterfall approach. Manage the Backlog: A backlog is a list of requests for work that must be resolved. Managing the backlog includes triaging, adding, editing, and prioritizing backlog items to ensure that all information is clear, transparent, and visible. Develop User Stories: User stories are feature descriptions written from the user’s point of view. User stories are generally brief (one or two sentences) and help define product or feature requirements. Frequently, the team will need additional “just in time” user stories as part of the development process. The product owner manages the flow of feedback and adjusts the backlog as needed. Attend Scrum Meetings: Scrum meetings (sometimes called stand-ups) are short, daily status meetings focused on providing project status and updates. Release Planning: Release planning is a detailed, evolving tool to streamline communications and establish timelines for milestones and product delivery. Work with Development and the Scrum Master: The product owner should be in regular contact with the development team and the Scrum master to ensure steady progress and to be aware of potential roadblocks. Engage Stakeholders, the Scrum Team, and Users: The product owner is the voice of the customer and should ensure there is no loss of information in the handoffs between user stories and the development team. Once you’ve identified the challenges that surface in user stories, be sure to encourage creative approaches within the team for solutions and inspire collaboration between the team and your customers. Keep communication open, through feedback loops, stand-up meetings, and more, to ensure that the team is developing the right product. Adhere to Business Goals and Manage Finances: The product owner is responsible for all resources, including finances, during development. This includes making decisions based on the best return on investment (ROI) and understanding the cost and benefit when prioritizing the backlog. Give Final Approval: The product owner has the responsibility and the authority to approve the work and decide whether it meets the acceptance criteria. For example, a user story at the beginning of the sprint could have been the ability to log in. The product owner can either accept (yes, the user can log in) or reject the story. It’s the product owner’s responsibility to support Acceptance Test-Driven Development (ATDD) based on the user story. Change the Course of the Project: Within the boundaries of the sprint, the product owner can steer the team in a different direction based on stakeholders’ needs and customer feedback. Understand Enabler Work: Enablers are the system architects and engineers who support the requirements of the business and its technical infrastructure. Product owners don’t need to have deep technical skills, but they should collaborate with enablers to ensure the company’s infrastructure will support the new software or application the Scrum team is developing. The goal of the Scrum framework is to deliver a product increment in every sprint. The product owner decides length of the sprint, which typically last two to four weeks, and guides the development team through the work needed to reach a key objective and have their output ready for review. One of the key roles of a product owner is to participate in all development events, including planning, the daily Scrum, refinement, review, team demos, retrospective, and the sprint. Along the way, the product owner champions the product, promotes the vision, and encourages the team. Before the sprint begins, product owners work with stakeholders and users to identify the project’s goals. These help identify the scope of the sprint and plan the work. Then at the beginning of a sprint, the product owner and the development team outline and agree upon the work to be completed during the sprint. The product owner establishes the criteria that the sprint must meet for review and acceptance, then creates the backlog items for the project. During the sprint, the product owner will attend stand-up meetings to observe, stay abreast of progress, and answer questions. The product owner will accept or reject backlog items in this phase, based on the acceptance and testing criteria. In refinement sessions during the sprint, the product owner can add or remove backlog items, as well as lead reviews to get feedback and adjust the development process. At the end of the sprint, the product owner leads the sprint demo, or review meeting, to update stakeholders. Any feedback from this review meeting can help with planning the next sprint and identifying items for the next sprint backlog. Once the sprint is complete, the project manager participates in the retrospective, evaluating the process and identifying opportunities for improvement. For product owners, it is imperative to outline sprint goals upfront, but according to Pichler, developing sprint goals comes with a caveat. “Unfortunately, many product owners and Agile teams either don’t use sprint goals or apply them ineffectively,” he says. “Sprint goals often state the stories to be implemented, rather than the reason for undertaking the iteration.” By defining why the sprint is being carried out and how goals will be met, everyone involved will be on the same page before the sprint begins, which will yield better outcomes. Lack of Authority: A product owner may not have enough support from management or from the right people in the organization. The Scrum team cannot be effective when the product owner lacks real authority to drive the work. Make sure you are empowered and have the support and trust from the people who matter in your company. Sense of Being Overwhelmed: Product owners may find they don’t have enough time to do the work or aren’t getting enough support from the team. In turn, these overworked product owners create bottlenecks for a project and are not always available for team members. If time is a problem, make sure the product owner has one job: serving as product owner to only one product. Companies often create agile teams without an official product owner, and they rely on “borrowing” someone from another job to fill in as needed. According to the Agile Alliance, the ideal ratio of product owner to product development team is 1:1, with a full-time product owner devoted to one team. This ratio also works for product owners who aren’t getting enough support from the team. When a team has only one product owner, there are clear lines of authority and decision-making. And if the product owner isn’t getting the support of the team, make sure the team has enough time to do the work and is collaborating effectively. Proxy Product Owner: Sometimes, companies use proxy owners when making the transition to Scrum workflow before naming a product owner. This can happen when the official product owner is not readily available and a team member steps in to do the work. Regardless of the cause, this lack of clear direction and authority can create confusion in the team. Partial Product Owner: Make sure you understand the entire scope of the work and have a commitment from the company to devote your full time and energy to the product. This includes access to market research and sales figures for the project, as well as other data to inform your decisions. Otherwise, you may find it difficult to take on all the responsibilities of a product owner. Act Like a Leader and Not a Manager: The main job of a product owner is to maximize value for the product. One of the goals of Scrum is that the team organizes itself based on the work. Trust team members to do their jobs, so you can focus on the value the product will bring to the organization. Redefine Success: A project manager is focused on completing a task on time and on budget. As a product owner, you should be product oriented and not focused solely on completing the task. The product’s success doesn’t depend on whether it is finished, but whether it meets users’ needs and reaches the right audience. This means you should focus on value, not the volume of meetings or analysis, or the velocity of product development. Focus on the User: Don’t get bogged down by trying to please stakeholders. Always listen to what the user needs and let that drive your decisions. Always listen and learn from the feedback of your customers. This means improving your time to learn rather than time to market. The evolution of the role of product owner is deeply connected to the Scrum framework, which exists in an Agile environment. A product owner is responsible for the project’s success, connecting users, developers, and stakeholders in creating the best product possible. The job is part marketing, part business, and part technology. The bottom line is that the product owner is looking for the best way to build a solution for customers. As the rate of innovation increases, many businesses turn to understanding more deeply the user experience and embrace design thinking. The skills of a product owner, who has passion for users and can inspire teams to do the work, become even more valuable. A product owner who knows what works for the team, the product, and the market can thrive in any industry. Product owners are the secret stars of Agile software development, driving sprints in a Scrum cycle to meet both stakeholders’ and customers’ needs. To stay on top of this continuously evolving process, product owners need a powerful tool where they can track progress, input, metrics, and more. Smartsheet offers the features that product owners most need to succeed. Smartsheet is a work management and automation platform that enables enterprises and teams to get from idea to impact — fast. 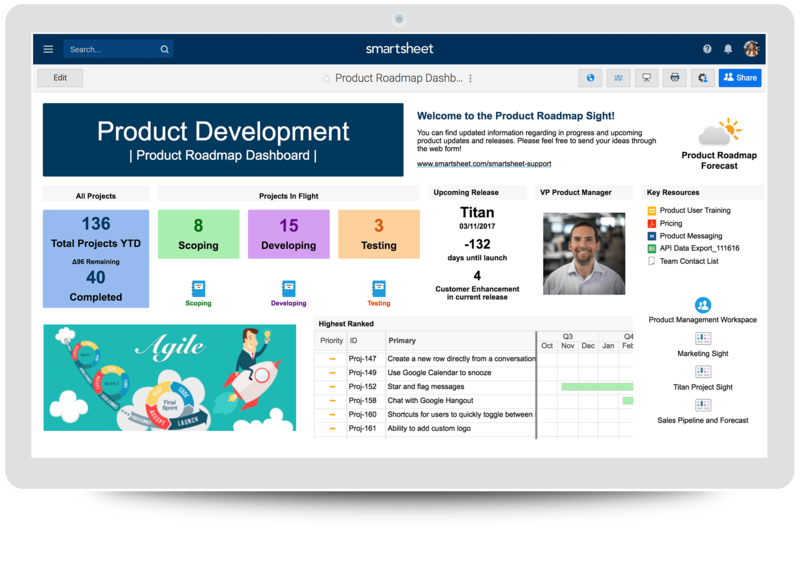 Leading software development teams rely on Smartsheet to focus, cross-functionally collaboration, and get products to market in record time. Use Smartsheet to streamline prioritization efforts, improve development consistency, and manage all activity in one platform. Accelerate time to market, improve internal and external coordination, and monitor launch readiness in real-time. Discover how Smartsheet can help maximize your software development efforts, today.